Home » Kohli and Smriti Mandhana named Wisden’s Leading Cricketers! It was a double delight for India as Virat Kohli and Smriti Mandhana clinched the ‘Leading Cricketer’ of the year honors by the Wisden Cricketer’s Almanack. Setting records have become very common for the Indian skipper and with this feat he has set the record of winning Wisden’s leading cricket in the world for three straight years 2016, 2017 and 2018. The winners were announced with the release of 156th edition of the Wisden Cricketer’s Almanack on Wednesday. It was first introduced in 1889 to reward excellent players who have performed in England in the previous summer. The Indian talisman was picked along with England’s Tammy Beaumont, Jos Buttler, Sam Curran, and Rory Burns as one of the five Wisden Leading Cricketers of the year. 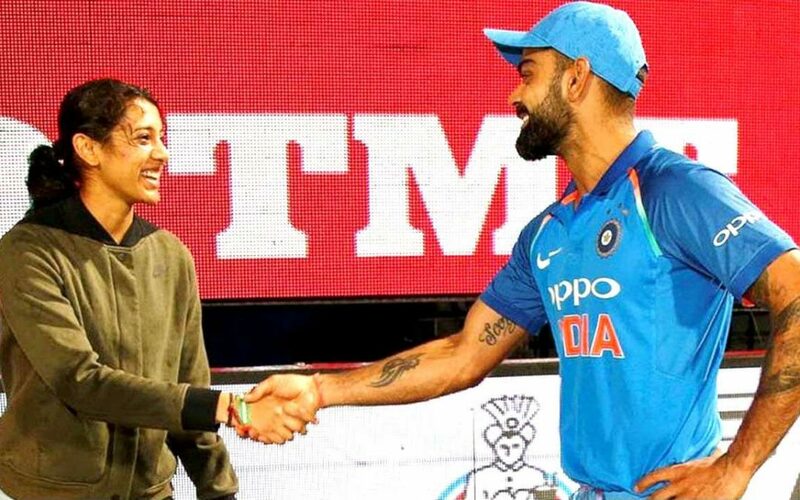 Smriti Mandhana was rewarded for scoring 669 and 662 runs in the ODIs and T20s last year and she also amassed 421 runs at an astounding strike rate of 174.68 in the Women’s Super League. Afghan spinner Rashid Khan was named as the Leading Cricketer of the year for the second consecutive year as he took 22 wickets at an average of 8.68 for Afghanistan in T20s, besides scalping 21 wickets in IPL 2018.